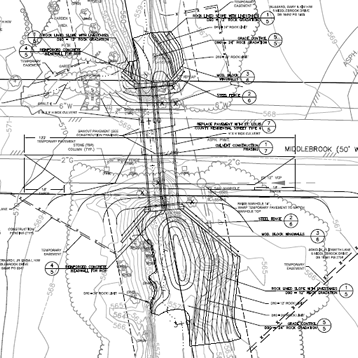 The city of Creve Coeur retained Intuition & Logic to design replacement culverts for Middlebrook Lane and Chiltron Lane. The existing 60” CMP Middlebrook Culvert was rusted at the invert and the CMP is exhibiting vertical deformation from the overburden. The existing 48” CMP Chilton culvert had also collapsed in one section. I&L provided analysis, design, plans, specifications and cost estimating for the replacement culverts. The Middlebrook Lane 60” CMP was replaced with a 56’ long, two stage reinforced concrete double box culvert, 5’H X 5’W and 4’H X 5’W. The Chilton Lane 48” CMP was replaced with a 60’ long, two stage reinforced concrete pipe culvert, 36” RCP and 48” RCP. Both designs included modular block headwall, roadway pavement replacement, sidewalk, decorative fencing, temporary pavement, construction phasing, traffic control and more. FEMA no-rise certification and USACE 404 permits were required for both designs. The Chilton culvert was constructed in 2014 and the Middlebrook culvert construction is delayed to allow for a new MSD sanitary line replacement to be constructed before the culvert replacement.